Rabbis for Human Rights: Beyond Politics: Making Strides for Palestinian Rights in the Current Situation (2015). 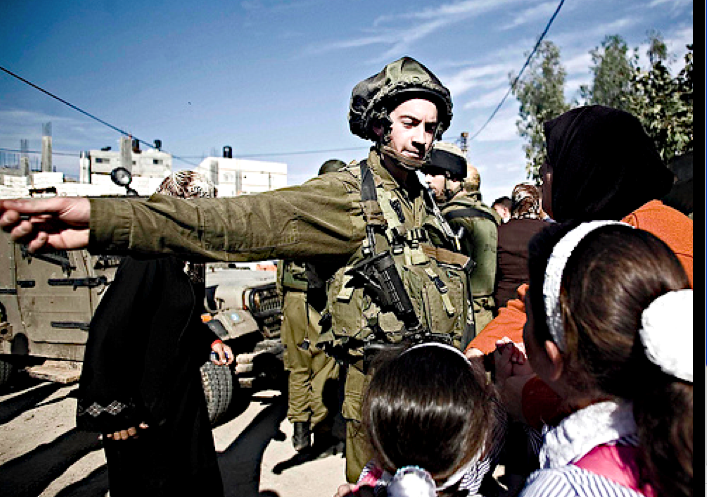 List of how Palestinians rights are violated in the West Bank, with footnotes. 4/27/2018: Amnesty International, "Israel: Arms Embargo Needed as Military Unlawfully Kills and Maims Gaza Protesters... In most of the fatal cases analysed by Amnesty International, victims were shot in the upper body, including the head and the chest, some from behind. Eyewitness testimonies, video and photographic evidence suggest that many were deliberately killed or injured while posing no immediate threat to the Israeli soldiers. " 2/6/2018: "It's What We Do: A Play About the Occupation". Includes video of play, which was based on Breaking the Silence testimonies, and written reaction by 4 Gazan youth. "The play answers several questions that have plagued my mind, like, 'If Israelis are humans like us, how can they ‘do what they do’? What are their motives? What do they feel during and after these acts? Do they feel regret or just brag about it? Do they really want peace? The title fits the play so much. I see now that behind every obstacle they throw in the way of Palestinians, there is indeed a strategy, and that every refusal of a building permit and every delay in issuing a lifesaving document is hellishly intended." 2/6/2018: "Dozens of Palestinian schools are at risk of being demolished by Israel, the UN has warned, leaving children in the occupied territories even more vulnerable." CNN, 8/29/17: "Israel demolishes schools for Palestinians, citing lack of permits... The European Union says about 100 structures -- homes, shelters, water networks, as well as schools -- in the West Bank and East Jerusalem, for which the EU or EU member states have provided funding, have been demolished or seized over the past year." Amesty International, 8/25/17: "Did you know that Israel has been banning Palestinians from organizing any protests for 50 years? 27 August marks 50 years since Israel issued Military Order 101, a law that punishes Palestinians for peaceful political expression." Mondoweiss, 8/23/17: "Israeli Forces Destroy New Village School Hours Before Children's First Day - BETHLEHEM, West Bank — Israeli military jeeps came barreling down towards Jubbet al-Dhib’s first and only primary school late Tuesday night, terrifying locals who had been finishing preparations for the school’s grand opening set for the next morning. Soldiers shot tear gas and rubber-coated steel bullets as they cleared the way for bulldozers and flatbed trucks brought in to take the school..."
Washington Post, 7/7/17: "This Palestinian village had solar power - until Israeli soldiers took it away"
Eyal Harel, veteran Israeli soldier, Ha'aretz, 6/19/17: "What Really Happens in the World's Most Moral Army" (paywall). "[W]e caught a Palestinian boy of no more than 12, riding a donkey between Qalqilyah and Kfar Sava. You don’t want to know that after a 'chase' of about five minutes, the Border Policeman shooed the donkey away and beat the boy up – why, I will never know. Because I didn’t ask." B'Tselem, Israeli human rights organization, 6/12/17: "Israeli soldiers detain Baraa Kan'an, a 19-year-old Palestinian, then abuse him for 7 hours... This abuse did not take place in a vacuum. It is part of a broader context. Over the years, B’Tselem has documented many similar incidents of violence and abuse..."
Charlie Zimmerman, participant in the Center for Jewish Nonviolence delegation in Palestine, 6/10/17: "Dispatch from 'the most ****ed up place on Earth,' Hebron's H2 quarter"
Israeli journalist Bradley Burston, 2/26/13: "In the name of occupation, generation after generation of Palestinians have been treated as property. They can be moved at will, shackled at will, tortured at will, have their families separated at will...” – link to original: "As Lincoln Abolished Slavery, Israel Must Abolish Occupation"
Carmi Gillan, head of the Israeli internal intelligence agency Shin Bet 1994-96, "We are making the lives of millions unbearable, into prolonged human suffering, [and] it kills me.” Avraham Shalom, Shin Bet head 1980-86: "[We’ve become] a brutal occupation force similar to the Germans in World War II.” - in The Gatekeepers, 2013 Oscar-nominated documentary. 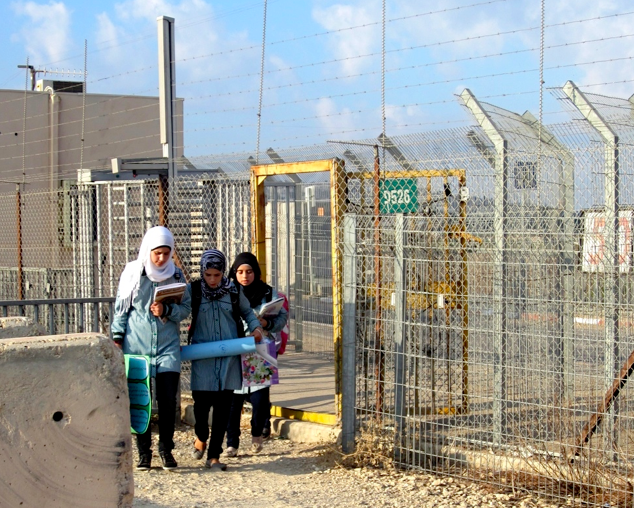 Aya Kaniuk and Tamar Goldschmidt, two Israelis reporting from checkpoints and military courts, 2010: A 13-year-old Palestinian child's trial in Israeli military court. "...Children and youths arrive in groups of two, three, sometimes four, wearing brown prisoners’ garb, their feet chained, one hand shackled to the next boy’s hand ... I noticed him in particular because he had soft, round curls, and because he looked very young, and because he wept..."
Joseph Dana, journalist based in the West Bank, 2/17/11: "Israeli army targets and arrests children in order to repress Palestinian dissent in the West Bank"
UNICEF, Children in Israeli Military Detention, pp. 13-14, 2/2013: “Ill-treatment of Palestinian children in the Israeli military detention system appears to be widespread, systematic and institutionalized... The pattern of ill-treatment includes the arrests of children at their homes between midnight and 5:00 am by heavily armed soldiers; the practice of blindfolding children and tying their hands with plastic ties; physical and verbal abuse during transfer to an interrogation site, including the use of painful restraints; lack of access to water, food, toilet facilities and medical care; interrogation using physical violence and threats; coerced confessions; and lack of access to lawyers or family members during interrogation." Hagai El-Ad, director of B'tselem, testimony to UN Security Council, 10/4/16: "Show me a plot of Palestinian land you wish taken over, and the [Israeli military command] Civil Administration will come up with the appropriately tailored legal mechanism – of course, it must all be legal! – to achieve that end: military training zones, nature reserves, archeological sites and, above all, declaring thousands of acres 'State Land' – what 'State' exactly? All these are successfully used in order to forcibly displace Palestinians and justify denying them access to running water or the power grid."